Club Med will introduce a new agent booking tool in the next three to six months, Camille Olivere, its new senior vice president of sales, told agents at a trade dinner in New York this week. Club Med is working with HBSi, a hotel booking solution, to connect its reservations system to agent booking tools. Olivere said one example of the kind of tool Club Med may connect with is VAX Vacation Access. It will continue to use Easy Club Med but improve its functionality. Olivere, who joined Club Med in February, also described Club Med�s growth plans and talked about the important role agents have to play in those plans. �We are upscale and growing and are really committed to you and looking for more opportunities to expand in the agent channel,� she told a group of about 25 agents. Club Med is in growth mode globally, planning to add new resorts and expand existing ones, Olivere said. It plans to re-introduce ski resorts in the U.S. and Canada in the next few years and wants to increase awareness of its ski product. Olivere said that Club Med has gone from being a mass-market product to one that is over 70% four- and five-Trident, Club Med�s in-house hotel rating system that is similar to four- and five-star properties. Minister of Foreign Affairs Bill Graham today in Paris signed an agreement with France, in the presence of the Minister Responsible for Cooperation and La Francophonie, Pierre-André Wiltzer, to encourage and expand the mobility of young people between 18 and 35 years of age. "We are delighted to foster the international mobility of young Canadians," said Minister Graham. "This agreement will enable some 7,000 young Canadians each year to gain international experience, thereby helping to make Canada a world leader in the global knowledge economy." The new agreement will bring to 14,000 the total number of places for Canadian and French young people to complete a field placement or to finish their studies as part of an exchange program, while travelling and working occasionally. This agreement, whose main goal is to consolidate and streamline administrative procedures for obtaining an extended residence permit and work permit, will contribute to a better understanding of our respective cultures in all areas. 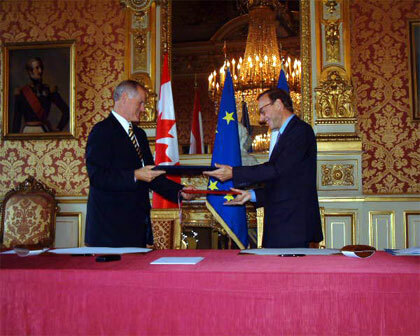 Beginning in 2004, this agreement will enable young Canadians to spend time touring France and exploring its culture, while having permission to work. In addition, students will be able to pursue professional activities in France during their university holidays, as well as fulfilling part of their university curriculum in a French school through an inter-university agreement. Lastly, young professionals will be able to sharpen their skills through employment contracts, and students will be able to obtain field placements to fulfil their course and training requirements. To date, the Working Holiday Program has enabled numerous young Canadians and French to work in the other country during their university holidays. In 2003, Canada issued some 4,000 visas to young French people.